New research shows growing awareness of the OBA Icon, and understanding of this EU Industry initiative to give control over targeted advertising choices. In 10 of the 13 countries surveyed, at least 1 in 4 consumers who are aware of the OBA Icon say they have clicked on it. 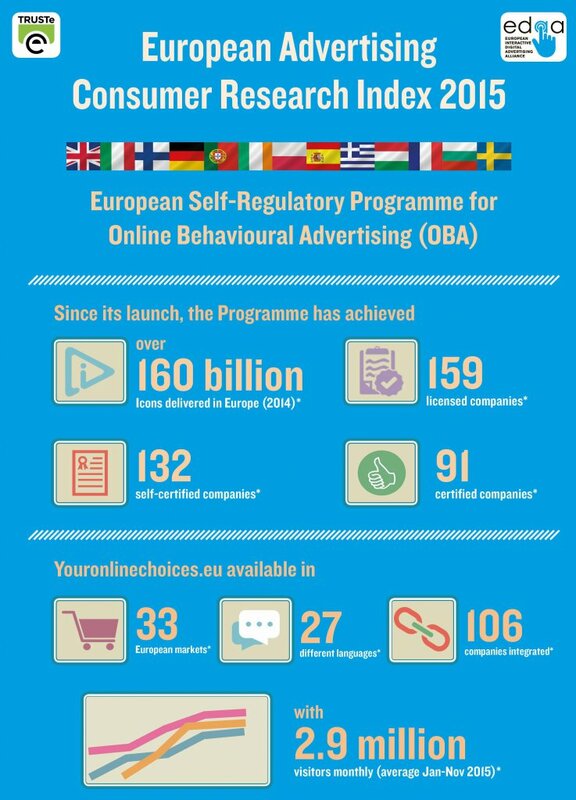 The European Advertising Consumer Research Index 2015 provides a comprehensive picture of attitudes and awareness of the European Self-Regulatory Programme for Online Behavioural Advertising (OBA) across 13 European countries surveyed. The study was conducted by Ipsos MORI, on behalf of TRUSTe and the EDAA from 21 October – 13 November 2015 with over 13,000 online adults. • Awareness of the OBA Icon with Admarker text (e.g. AdChoices) is highest in Portugal (40%), Greece (38%) and Ireland (32%), followed by Great Britain, where awareness has risen steadily for the last four years from 13% in 2012 to 28% this year. In eight of the thirteen countries surveyed awareness of the OBA Icon when accompanied by the Admarker text is significantly higher. • Awareness of the Icon with Admarker text has increased three points to 21% among 18-50 year olds. • In ten of the 13 European countries surveyed at least 1 in 4 report they have clicked on it. This is as high as around 2 in 5 in Poland (40%), Spain and Bulgaria (both 39%) and Greece (38%). • Understanding of the Icon is increasing with adults in 11 (of 13) countries who had seen the icon placing “manage your privacy preferences” in their top two choices for the meaning of the Icon, compared with only 4 (of 10) countries in 2014. • 35% report having this information available makes them trust the brand being advertised more. The study was conducted online by Ipsos MORI, on behalf of TRUSTe and the EDAA from 21 October – 13 November 2015 with over 13,000 adults across 13 different European countries listed below. Interviews were carried out on Ipsos MORI’s online i:Omnibus service using a quota sample of adults who are members of Ipsos’ European Online Panel. For each country, quotas were set and data weighted according to age, gender and region. The ages of adults interviewed for each country were as follows: Great Britain and France (adults aged 16-75), Germany and Italy (adults aged 16-70), Spain and Sweden (adults aged 16-65), Hungary and Poland (adults aged 16-60), Finland and Ireland (adults aged 18-65), Portugal and Bulgaria (adults aged 18-55), and Greece (adults aged 18-50). The following number of adults in each country report having seen the icon in either form (either with the Admarker or without it): Bulgaria – 158, Finland – 64, France – 172, Germany – 113, Great Britain – 334, Greece – 424, Hungary – 310, Ireland – 330, Italy – 139, Poland – 135, Portugal – 401, Spain – 131, Sweden – 89. Due to low base sizes, data relating to questions asked only to adults who report having seen the icon in Finland and Sweden should be interpreted with caution.